Unreleased Live Album By Jazz Drum Legend Buddy Rich “Birdland” As Seen In Award Winning Film “Whiplash” To Be Released May 26, 2015! Studio City, CA – Lightyear Entertainment and Lobitos Creek Ranch, in association with Scabeba Entertainment and the Buddy Rich Estate, have announced the release of a new live album featuring Buddy Rich and his Killer Force Band at the peak of their performing years. This rare, previously unreleased, and all original production was recorded with Buddy’s permission by bandmate Alan Gauvin, who has also now mixed and edited the project together. The album was mastered by Tom Swift, and will be released May 26 through Caroline Distribution, the independent distribution arm of Universal Music Group, on the Lightyear/Lobitos Creek label. The Birdland album is seen in the Academy Award winning film Whiplash, in the hands of the young star Miles Teller, who plays an extraordinary drummer who idolizes Buddy Rich. 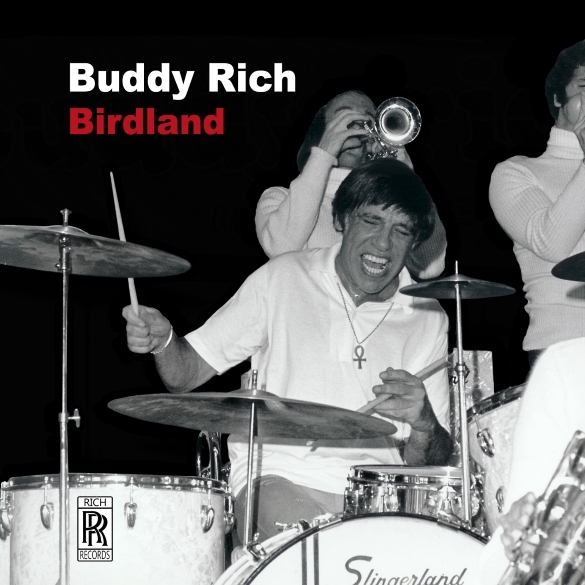 The digital version of Birdland was rush released worldwide on February 24 to coincide with the Oscars airing and is already the most downloaded Buddy Rich album in recent history after just a few weeks. A vinyl LP of Birdland is scheduled for a June 23rd release. Lightyear, Lobitos Creek, and Scabeba have previously teamed to release two successful DVDs, The Lost Tapes and The Channel One Suite, and two previous live CDs featuring Buddy and his band: Time Out and No Funny Hats. In addition, in 2014, Lightyear/Lobitos released The Solos, which was comprised purely of Buddy Rich drum solos, and culled from his performances in 1976 and 1977, at the peak of his power and versatility. The album showcases 9 of his premiere solo performances, recorded while on worldwide tour with his band. All of the DVDs and CDs are available through Caroline/UMG. Cathy Rich, CEO of Scabeba Entertainment and Buddy’s daughter, who authorized the release, was a consultant on the Whiplash film. She is currently on tour with her Buddy Rich Band. This entry was posted on Wednesday, April 8th, 2015 at 23:07	and posted in Buddy Rich, Press Release. You can follow any responses to this entry through the RSS 2.0 feed.